First Friday of Bible School in Nsanje! “So I sent for you immediately and it was good of you to come. Now we are all here in the presence of God to listen to everything the Lord has commanded you to tell us” (Acts 10:33). It is a humbling experience and we are all growing through it, the teachers and the students alike. Would God have it any other way? It’s Friday night. What better time to hold an appreciation dinner for our wonderful translators? Today is Friday and the end of the first week of the Bible School. David teaches two classes today to the First Year Students. That is one hundred and seven students from either Malawi, who speak Chichewa, or from Mozambique,who speak Portuguese. This means that whatever you speak is translated into two languages. He is excited to be teaching an International Bible School with multiple translators. Until now, he has been teaching only the small class of thirty four Returning Graduates, and in that class there is only one translator because they all understand Chichewa, even the few of them that are from Mozambique. Ian and I have warned him that two translators slow things down and you have to trim your class content a lot and he has done that. The Portuguese translator we had Thursday cannot stand very long at all and he does not understand any English, only Chichewa, so he must wait for the English to Chichewa translation before he can translate. This class is called Your Identity In Christ. David will skip directly to the how to affirm another person section, which is the best part. After some discussion, the problem is explained to David. 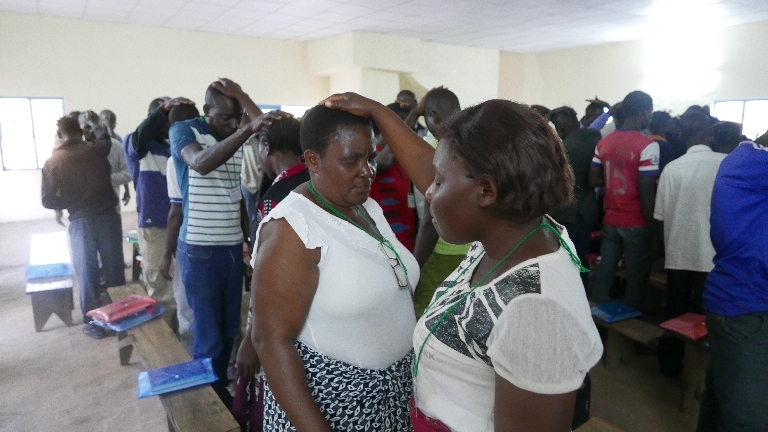 Many people have partnered with friends they have made at the conference from the other country, and while they have been learning a few words of each others language at meals, they do not know enough to do this exercise. The great news is that networking between nations has been happening through the power of the Holy Spirit and their natural curiosity about each other. However, for the exercise, we must rearrange the partners and the chairs again. In the end, the students have each been encouraged by these personal promises from the Bible. David teaching the affirmation class. During this time Ian is teaching the Returning Graduates a class on “Jesus casts out Demons”. Ian gives examples of times Jesus cast out demons. He is preparing them for Vicki’s class this afternoon when she will teach them that Jesus has given them the power to cast out demons in His name. For the second class period, Joey is teaching the Returning Graduates about “Learning to hear God Speak” and Ian is back with the First Year students to help David with his Walking with the Lord skit. The students all love Ian and they like having him play the part of Jesus. The skit is about how once we are saved, we try to walk with the Lord. However, sometimes we get distracted by the troubles of this world and worry and carry burdens that we were never intended to carry. There are bags of burdens all over the stage. David starts out walking with Jesus (Ian). After a little while he picks up a bag, but is still walking with Jesus (Ian). Pretty soon David picked up more bags, is all hunched over and not following Jesus anymore. Jesus (Ian) keeps trying to get David’s attention, but he just keeps picking up more bags. The more Ian tries to get David’s attention the more the class laughs (as intended). Finally, David notices Jesus (Ian) and lets Him take all the bags and then David is again walking with the Lord. All of this setup is to get to the main point of the lesson, as we walk with the Lord, we not only do the good works he has planned in advance for us to do, but we become more like Jesus and sin becomes less appealing. We begin to see other people as Jesus sees them. All of our lessons are directed to big and encouraging ideas like this, so this is only one example of how the classes are designed. 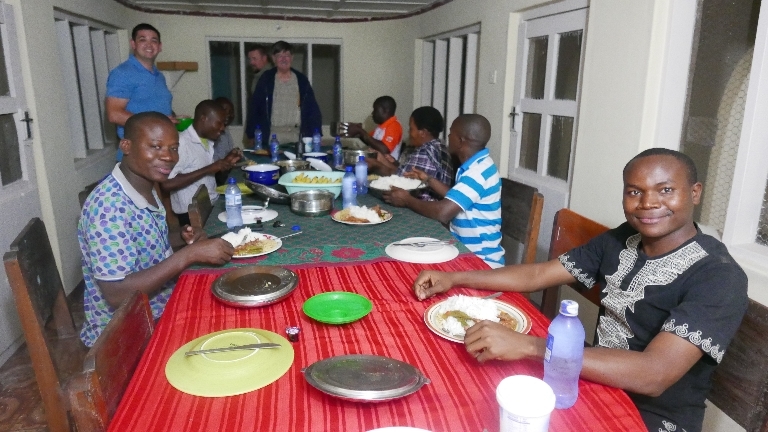 After another delicious lunch at Pastor Chilemba’s house we have a short rest before the afternoon sessions. Joey gets his chance with the First year students and teaches about Wise King Solomon. They have previously learned about Weak King Saul and Brave King David. After teaching First Year he agrees with our David that it is a fantastic experience. Meanwhile, Vicki is teaching the Returning Graduates about how Jesus Christ has given them the authority to cast out demons in the name of Jesus. Vicki teaching under a tree again because it is to hot inside for the students to stay awake. The power is out and that means the small classroom has no fans to bring in fresh air. David and Ian went to the store with Pastor Phillip to buy water. He found a store with 16 big bottles of water and took them to our rooms. We have been drinking a lot of water recently and bought all they had. Vicki teaching under the trees because of the heat. Later that day, David and Ian were hanging out on the porch by the street when a van got stuck and a small man and young boy struggled to get the car up the incline and back onto the street. Ian dashed to the rescue and soon the van was back on the road. 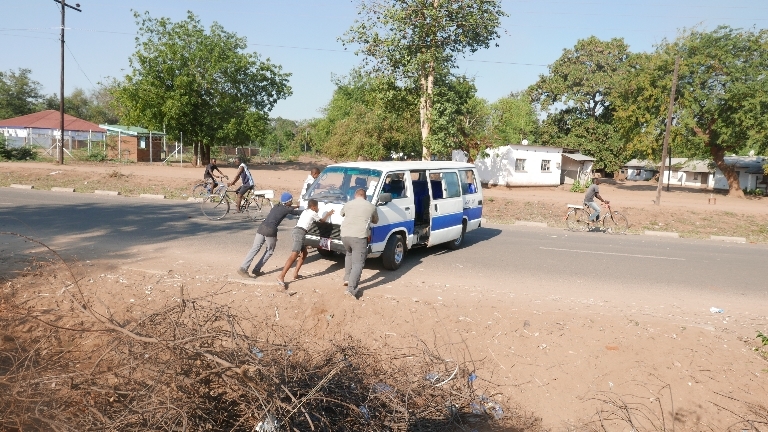 White people are guests here in Nsanje and the people carry our bags everywhere we go, we are waited on constantly. We just imagine the story these people will tell at supper tonight. We got stuck in front of the World Bible Church and suddenly this huge strong white man appeared out of nowhere and pushed the van back up onto the street like it was a toy. Who knows, perhaps they will come to church Sunday to see what is happening at World Bible Church. Ian pushes the van out of the ditch. All one hundred forty-one students are together for the anointing with oil session. Vicki teaches them how Moses anointed Aaron and his sons for service by anointing there right ear lobe, right thumb, and right toe. When Vicki announces they will each get their own bottle of anointing oil there are huge cheers. They are so grateful for every gift they receive. Then she describes how to use this oil to anoint a person for healing (James 5:14-16). We anoint each of them for service as pastors and deacons in the service of our Lord Jesus. We set up an assembly line with Ian putting a drop of oil on the right ear lobe as he says “We anoint you in the name of the Father”, then David puts oil on their right thumb and says “and the Son”, then Joey anoints their right toe and says “and the Holy Spirit”. Then Vicki gives them their own bottle of Anointing Oil and they sit back down and put their shoes back on. The line moves quickly and in no time we encourage them to anoint someone else that the Lord has placed on their heart. While the praise team plays “I surrender all”, we also go around anointing people. It is all a huge blessing. Several pictures follow. As in interesting aside, we did not have enough bottles of oil when we began handing them out. Vicki continued to hand out the oils and God provided. There were 12 bottles of anointing oil left, reminding Vicki of the 12 baskets of leftovers after the miraculous feeding of the 5000.